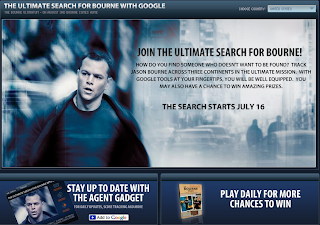 At first you may ask what am I on about with the tile of this blog, but Universal Pictures and Google announced a new online game, The Ultimate Search for Bourne with Google. It is designed to promote the new ‘Bourne Ultimatum’ film and is designed for the player to use a suite of Google products such as Search, Maps, Images and of course YouTube. It will launch in seven countries and incorporates a sweepstakes element. Players will have to track rogue agent Jason Bourne across three continents and solve clues that bring them closer to uncovering Bourne's identity. But here the best bit…the prizes! Top prize is a Volkswagen Touareg 2, Mastercard are awarding 15 daily $1000 gift cards, a $25,000 prize, 4 trips to New York, Paris, London, Madrid or Tangier and in my eyes best of all 10 Apple iPhones. See you in there on the 16th I know I am going to be there.